Epoq, the elected president of the planet Trillia praises the heroics of Tyro and his team for bringing Superman to justice for crimes against the Trillians. Epoq's idea of justice, however, consists of publicly punishing the Man of Steel, which, as Tyro insists, seems more akin to torture. Alone and bound in his cell, Kal-El experiences visions of his biological father, Jor-El, and his adoptive father, Jonathan Kent. Engaging in spectral colloquy with his two father-figures, Superman is reassured of the life lessons they both instilled in their son: he has great power, so he should do what's right - because he can. Meanwhile, Tyro returns to his neighborhood a hero and is greeted by his own son. To Tyro's dismay, his boy has been swept up by the thrill of the public displays of Superman's punishment. Tyro, a scientist, seeks truth, and the enjoyment his boy gets from the intense pain of another causes Tyro to question the reality of the supposed justice being served. True to his craft, Tyro looks for answers. He visits Superman in his cell, and just as Superman insists that Epoq, elected or not, is merely a tyrant satisfied with perpetuating a myth, explosions judder the cell. It seems Superman's disciples have arrived and they're determined on rescuing their savior. Supes be praised! The Mangals are here! Story - 5: I've mentioned twice before how individual issues of these digital titles can be either slim pickings on story, or jammed full like a rich kid's Christmas stocking. Well, let's go for trilogy: these issues are often one or the other, and "Judgement Day" definitely feels like a Christmas morning at the Trump's. There is something a little ineffable about the story, though. It has - and please excuse my inability to find a more suitable tag - presence. When reading, I felt such a leap forward in the characters that it seemed I was witness to their crisis in actuality. That's good writing. Even Superman, our Old Cowhand, with three quarters of a century under his cape, feels excitingly fresh. Superman's plight feels genuine and as readers, even before we're Superman fans, we're drawn into that plight, and bleed sympathy. What accentuates that even more are the visions of Superman's fathers. We can infer that they aren't the ghosts of Jor-El and Jonathan Kent, but rather hallucinations brought on by Superman's condition. Regardless, the beat in the story where this occurs was perfection. I'm starting to like Tyro a lot. He's a quasi-tragic figure, who seems to be slowly morphing into a reluctant hero. Tyro simply wanted to do good by his people and bring to justice the criminal responsible for Trillia's problems with the Mangals. Now, he questions the truth of the events of history and the ethics of the justice. He's a good character, like Superman is good, and if their short exchange foreshadows anything it's their eventual co-understanding and admiration. 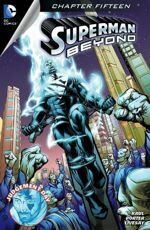 I would hope to see Tyro appear again at some point in future adventures with Superman; however, like Porter in Green Lantern Corps (vol.3), I fear Tyro will become an interesting character who is too quickly introduced and then forgotten. Finally, the Mangals! I'm very interested in seeing how these overgrown snarling Snarfs fit into this already excellent story. There was one interesting point made in the story that gave me pause. Apparently Trillia has no seismic activity. So, does this mean the planet is incapable of releasing build-ups of energy? Does Trillia have no tectonic plates, or are the plates no longer active? This would be unfortunate, seeing as how tectonics help in regulating the hospitable functions of an atmosphere. Are there no volcanoes, either? If there are volcanoes, the shifting of magma within them would cause seismic activity. Ultimately, a planet with absolutely no seismic activity would likely have an unregulated greenhouse effect, perhaps harboring a waterless surface and inhospitable atmosphere. Am I nitpicking? Yeah, I am. Superman is science fiction, after all, and this story is still frickin' awesome. Art - 3: Has anyone been paying attention to Porter's work outside of this title? Honestly, what gives? Why is his work here so consistently shabby? Now, I have been going easier on him for the past five issues because he truly has brought more worthy art to the project, but looking at some of the stuff he's drawn for other titles, I'm baffled why he isn't pouring as much love into his pens on Superman Beyond. Anyway, Porter's art is passable again, but my critiques are running out of excuses for him. Cover Art - 3: This is a decent cover, but nothing much to write home about. Comparatively it's weak, especially when we take a gander back at the previous cover featuring Lobo.